The innate or natural immune system recognizes a wide spectrum of pathogens without a need for prior exposure. The main cells responsible for innate immunity, monocytes/macrophages and neutrophils, phagocytose microbial pathogens and trigger the innate, inflammatory and specific immune responses. Members of the Toll-like receptor (TLR) family, first discovered in drosophila, have been shown to be pattern recognition receptors, each member recognizing and responding to different microbial components to limit/eradicate invading microbes. Binding of pathogen-associated molecular patterns (PAMP) to TLRs induces the production of reactive oxygen and nitrogen intermediates, initiation of the pro-inflammatory cytokine network and upregulation of costimulatory molecules linking the rapid innate response to the adaptive immunity. 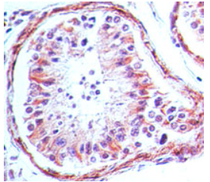 Fig.2: Immunohistochemical analysis of TLR4 in formalin-fixed paraffin-embedded human testis tissue using TLR4 antibody SM7124P at 5 µg/ml. The TLR family has significant homology in its cytoplasmic domain to the IL-1 receptor type I. Studies so far show that signaling pathways via TLRs originate from the conserved Toll/IL-1 receptor (TIR) domain. 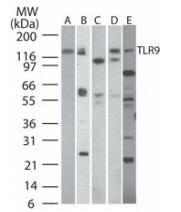 The TIR domain-containing MyD88 acts as a common adapter that induces secretion of inflammatory cytokines such as IL-1, IL-6, IL-8, IL-12 and TNF-alpha, and induction of co-stimulatory molecules. A MyD88-independent pathway also has been reported to induce type I Interferons (IFNs) in the TLR4 and TLR3 signaling pathway. Another TIR domain-containing adapter, TIRAP/Mal has recently been shown to mediate the MyD88-dependent activation in the TLR4 and TLR2 signaling pathway. Thus, individual TLRs may utilize different signaling systems that characterize their specific activities. In addition to induction of the cytokine network, MyD88 binds FADD and triggers apoptosis through the caspase cascade. Hence, activation of the apoptosis pathway via TLRs appears to contribute to the repertoire of defense mechanisms utilized by the innate immune response. 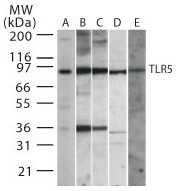 Fig.4: Western blot analysis of TLR5 in (A) Ramos, (B) raw, (C) mouse spleen, (D) mouse lung and (E) rat lung whole cell lysate using Cat.-No. SP7197P at 2 µg/ml. The ligands for TLR2, TLR3, TLR4, TLR7 and TLR9 have been reported. 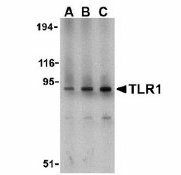 TLR2, in association with TLR1 and/or TLR6, recognizes and signals bacterial lipoproteins (BLP) and peptidoglycans from Gram-positive bacteria. Recently, it was discovered that TLR3 recognizes dsRNA. LPS from Gram-negative bacteria signals through TLR4. The immune response modifiers, imiquimod and resiquimod, have been reported as agonists for TLR7. Cellular response to the CpG motif of bacterial DNA is mediated by TLR9. The cDNA for human TLR10 codes for a protein containing 811 amino acids. Human TLR10 is closely related to human TLR1 and TLR6. 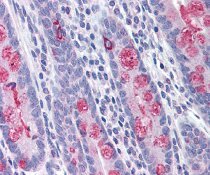 TLR10 is expressed in tissues and cells of the immune system. TLR10, originally identified from a spleen cDNA library, is on chromosome 4p14 and has been found to be expressed in lung and in B-lymphocytes. TLR10 is thought to be a potential asthma candidate gene because early life innate immune responses to ubiquitous inhaled allergens and PAMPs may influence asthma susceptibility. In addition to the innate immune response, evidence implicates the involvement of the TLR family in a spectrum of systemic disorders following bacterial infections including sepsis, cardiac ischemia, peridontitis, and cerebral palsy. The rapid pace of research in the TLR family will elucidate their functions and potential therapeutic interventions. OriGene Technologies offers a wide range of antibodies for characterizing members of the TLR family. A short overview is given in the product list, please note that a majority of these antibodies are also available in Biotin- or fluorescence-dye conjugated formats suitable for particular applications. Akira, S. et al. (2001) Toll-like receptors: critical proteins linking innate and acquired immunity. Hopkins PA, Sriskandan S.: Mammalian Toll-like receptors: to immunity and beyond. Clin Exp Immunol. Jun 2005;140(3):395-407. 33 products - FILTER YOUR RESULTS!